Improving the quality of life for Russians with disabilities was a focus for the government leading up to the Paralympic Games. Will the initiatives continue? The success of the Russian Paralympic team in the recent Winter Paralympic Games and the state-of-the-art facilities built for the Games in Sochi could give the impression that today’s Russia is doing a lot to integrate disabled people into society. Appearances, however, can be deceiving. Now that the fanfare over Sochi has abated, people with special needs and their advocates fear that the progress made leading up to the Games will stagnate, and improving life for Russians with disabilities will slip from the agenda of government officials. A nationwide study conducted by Human Rights Watch of Russians with a range of disabilities revealed legitimate concerns and frustrations with both state and society. The infrastructure in Russian cities poses an insurmountable obstacle for many people with physical impairments, and it is especially hard for disabled people to find work. When they do, they tend to be employed in specially created jobs that often only enhance their isolation, according to the study. Moreover, medical facilities and doctors are insufficiently prepared to treat special needs. According to Human Rights Watch experts, most of the problems Russia faces today in caring for people with disabilities are rooted in the Soviet past. “At that time, the state guaranteed material assistance, but rather than being integrated into society, recipients could be deliberately isolated,” the study authors wrote. regarded self-organization among the disabled as borderline dissidence. confined to a wheelchair, he founded the Soviet Union’s first association championing the rights of people with disabilities. This resulted in years of harassment by the intelligence services, searches and a smear campaign in the press, until Fefyolov finally emigrated under K.G.B. pressure to West Germany. 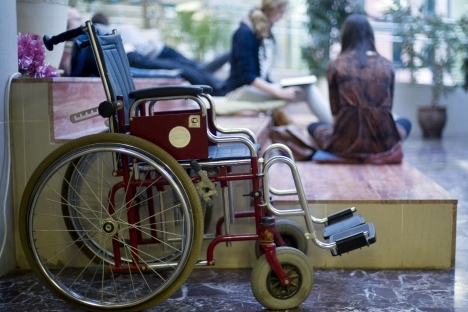 The situation has changed dramatically for Russians with disabilities since that time. Russia has ratified the United Nations 2012 Convention on the Rights of Persons with Disabilities and also launched a $5.5 billion project for its implementation. By 2015, funds will be disbursed for renovation of public buildings and redesign of sidewalks and for new buses and trains. Additionally, websites for government agencies will be updated to provide information on programs for people with disabilities. With more than 16,000 wheelchair users, Moscow should be leading the way in developing infrastructure for Russians who have mobility challenges. According to official data, however, only half of the capital’s buses have modern, low-floored designs; only two-thirds of public buildings are accessible for wheelchair users; and only a handful of subway stations are equipped with elevators. A plan for development calls for all public buildings to be fitted with ramps and all traffic lights equipped with sound signals for blind pedestrians by 2015, but while these initiatives sound promising, Russia has long had issues following through with such programs. Former chef Maxim Okolov, who suffers from multiple sclerosis and has been wheelchair-bound for five years, has taken it upon himself to hold the city government accountable. Armed with his own camera, he regularly films himself testing municipal facilities or new ramps and walkways in a wheelchair and then posts the videos online. Okolov rarely manages to get out of his neigborhood in the south of the city because he cannot use his electric wheelchair in most of the subway stations — only the newer stations have lifts. “The most I could do was ride from one end of the line to the other,” he said. Equally absurd, noted Okolov, is the fact that while many buildings have ramps at the entrance, there are often steps from the entrance to the elevators, and many elevators are too small for wheelchairs. Maria Gendeleva, a universal design expert working for Perspektiva, an N.G.O. that advocates for people with disabilities, also criticizes the implementation of many projects. According to Gendeleva, too little attention is paid during construction to how people will actually use the items being planned. “People with disabilities should be involved in the planning. Otherwise, many of these things will go unused,” Gendeleva said. Yanina Urusova from the organization Without Borders believes that only initiatives from the private sector will bring change. Founded in 2008 by German businessman Tobias Reisner, Without Borders seeks to provide a new perspective on disability issues among Russians. Without Borders was created to help professionals with disabilities such as lawyers, translators and programmers find good jobs. Since then, however, the organization has expanded and now also runs projects in fashion and art. “We created a fashion design competition that creates clothes that not only make life easier for people with various disabilities but look good too,” said Urusova. A particular source of pride is the “Acropolis” art project, which actively celebrates the beauty of a disabled person’s body. Hosting the Paralympics in Sochi provided an opportunity for Russia to really show that it is willing to create the infrastructure needed to integrate people with disablities into society at large. Apart from the adaptation of sports venues required for Paralympic events, universally friendly measures were extended to the broader city, including a number of walking paths and ramps. As a result, Sochi is probably the best city for people with disabilities to visit in Russia today. Hopefully the progress made there will inspire other Russian cities to make similar changes and improve life for Russians with disabilities across the country. 1. There are 12.85 million people with disabilities in Russia out of a population of 143.5 million. In comparison, approximately 50 million Americans, or about one in five are living with a disability, according to the C.D.C. 2. In Russia, only 32 percent of the 2.5 million people with disabilities who of working age are employed. Fifty-six percent of Americans with disabilities are working, according to a 2002 report on Americans with Disabilities. 3. This year, 122.6 million rubles will be allocated to help Russians with disabiliites find jobs as part of the Accessible Environment program. The money will be distributed via nonprofit organizations that work with the disabled. 4. According to a recent study by the online job site HeadHunter.ru, 50 percent of Russian companies surveyed have staff with disabilities. None of the companies surveyed reported any problems with these staff members.